Shirts, handcuffs, batons and pants have been reported missing by police officers in the last three years. Nearly 200 items of kit were recorded as lost or stolen by South Wales Police, including 40 torches, helmets, and a public protection suit. Stolen items included a female police officer's trousers and shirt, a pair of stab-resistant gloves, handcuffs, and two 21 inches (53cm) batons. 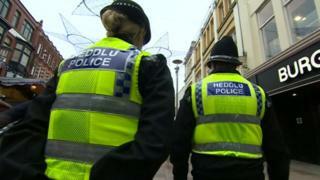 South Wales Police said officers "take every care" to keep property secure. Assistant Chief Constable Jeremy Vaughan said officers could be victims of crime while carrying out their duties and anyone who found police property should return it to the nearest police station. But the TaxPayers' Alliance said it was worrying that police seemed "so careless as to lose the shirts off their own backs". South Wales Police was the only force to provide the data to BBC Wales following a request under the Freedom of Information Act. Torches were the most misplaced pieces of kit, with 40 going missing at the cost of £640, while some of the strangest items stolen were six female officer's shirts and two pairs of trousers. An array of pieces of uniform, including 12 anoraks, four belts, a number of ties, fleeces, boots, helmets, bowler hats, and warrant cards were also recorded as being lost. Meanwhile 23 handcuffs went missing - two of which were stolen - and two harnesses for storing batons and spray were also stolen. The most expensive item lost by an officer was a riot or public protection suit, costing £170 to replace, with the total cost of replacing the missing items falling just short of £5,000. ACC Vaughan said there were robust procedures in place to make sure all information was secure and any mobiles or radios would be disabled and useless if they fall into the wrong hands. He said: "Despite the numerous precautions taken, South Wales Police and its staff can unfortunately become victims of crime - particularly when frontline officers are carrying out their duties - and equipment can be lost or stolen in these instances. "This is, of course, regrettable however when faced with situations which can often be hostile and fast-paced, our priority is to resolve those situations as swiftly as possible in order to ensure the safety of all involved as well as the wider public. "Whenever equipment is lost or stolen, each incident is recorded and fully investigated, and in many cases property has been recovered and the perpetrators prosecuted."